Pontoon boats are all about family, friends and relaxation. A bimini top is a great way to make sure you have a perfect day out on the water by providing shade and protection from the sun the rain. Fold it up or spread it out depending on the day's activities. The versitility of the bimini top just can't be beat! Instant shade to protect friends and family. No need to worry about sunstroke, allowing you to stay out on the water all day long! Protects your boat and equipment from sun damage, increasing the life of your pontoon and improving resale value. Bimini Tops allow boaters to enjoy a day out on the water without being in direct sunlight. It is also a quick solution for unexpected rainfall. Rear support poles keep the frame sturdy against wind. Make sure that the top is folded back when picking up speed to avoid damaging the bimini top. Bimini tops are often preferred over full enclosures because they provide protection without enclosing the entire pontoon and obstructing the passenger's view. Bimini tops can also be folded back out of the way for full sun exposure. Be sure that you measure your pontoon before purchasing a bimini top to ensure that we can provide the perfect pontoon cover for you. Twice the shade--double the fun! 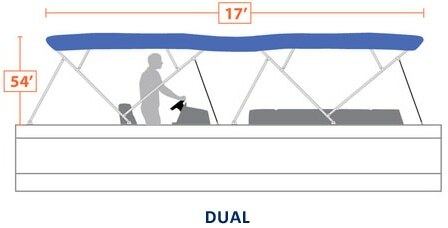 Dual pontoon bimini tops provide full coverage and protection from sun and rain to increase the life span of your boat. Have a party on the water while keeping your passengers protected from the elements! Rear support poles stabilize the frame against the wind, but keep the top folded back when picking up speed to avoid damaging the bimini top. Available in 12 vibrant colors to choose from! Colorfast bimini canvas is solution dyed so the color will never bleed or fade away. 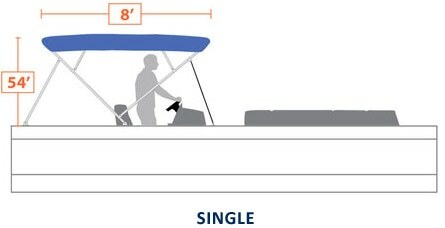 Be sure to measure your boat before purchasing a bimini top to ensure that we can provide the perfect cover to meet your needs. We offer the option of two top quality brands, Summerset and Summerset ELITE, featuring Sunbrella fabric. Purchase a dual pontoon bimini top today--to protect your investment tomorrow! Solution dyed polyester fabric is the best type of material for marine applications. The yarn is dyed before it is made into solution dyed fabric, which means the color is more vibrant and resists fading much better than fabric that is dyed after being woven. Some other companies may use cotton for their tops or even standard sewing thread, and this is something customers need to avoid if they are interested in buying a top that will last longer than six months. Our bimini tops come with zippered sleeves that make it easier to install onto the frame, which is important when replacing the canvas of an existing frame. Coated and sealed polyester is strong against UV rays, which allows it to retain shape and resist stretching. It is the best type of material according to the Boat Owners Association of the United States. It is thick enough to keep water out, but it lets water vapor through in order to provent mold or mild dew from building up. Sunbrella(R) marine fabric is featured on our Elite series. It is the most recognized outdoor fabric brand on the market available for both pontoons and boat biminis.